It was decided that the house needed an extra storage place to place all of the kitchen utilities and canned food. The pantry was designed to be able to hold pans, pots, cutting boards, and anything that requires additional space outside of the kitchen cabinets. 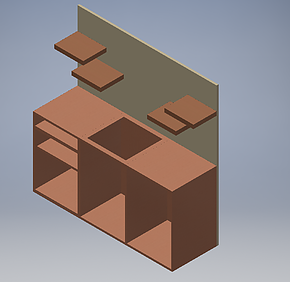 The drawing of the cabinets have been designed and there will be additoinal changes to the design. 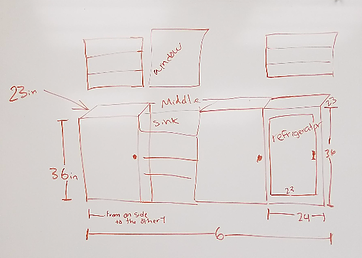 This design is simply a rough sketch of what it kitchen space should looked like. The plan is to place three kitchen cabinets, where one of them will hold a mini fridge. The kithchen space will also have cupboards for additional space. The tiny house be constructed completely out of wood. The first floor will have tw windows: one in the kitchen space and the second will be located near the house entrance. There will also be a small top window in the loft. The roof is designed to be slanted in order to maximise the space of the room and give just enough space to rest comfortably. The final design of the kitchen cabinets consists of two cabinets on either side of a kitchen sink. There will be four shelves on the wall for additional space. The shelves will give the kitchen an uncluttered feel. The wall will also have a window in the center to make the kitchen space seem open. The more open atmosphere that the house has, the better; especially since it already is a small house. 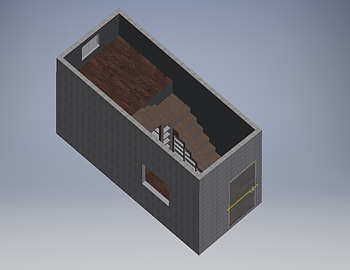 If the stairs are included in the final house designs, they will be facing the entrance. The stairs take much more space than originally imagined so the stairs are up to debate. If the team decides on maintaining the stairs, then they will also serve as extra storage space and a divider for the kitchen and the entrance. The design of the staircase is formed to create as much space as possible and still have a safe form to reach the second floor. 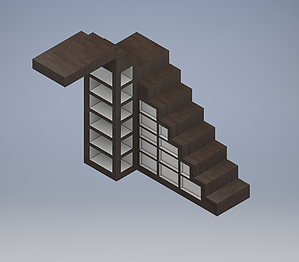 There are multiple shelves integrated into the staircase that provides an extra storage place for clothes or other essentials. 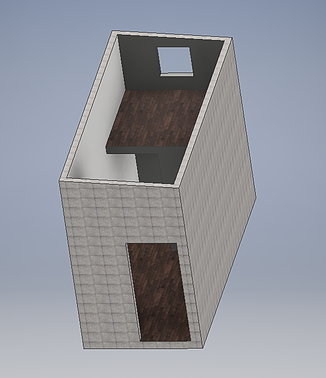 Currently, the tiny house team is debating whether or not the stairs should be included. It might take too much space that could be better used. The stairs could also make the house seem smaller and less spacious. Potential replacement of the stairs with a small ladder that is integrated into the walls of the tiny house. Although those are the current measures, the measurements will change deoending on the trailer size which could possibly have a smaller width. Basic home framing. The tiny house members will be responsible for obtaining all materials and building the house themselves with the assitance of an expert. There will be a total of two kitchen cabinets surrounding the kitchen sink. It will have four shelves for additional kitchen space. There will be a mini fridge that will fit inside one of the cabinets. It will be a minimal kitchen with the basic necessities. The inside of the stairs will be storage space. 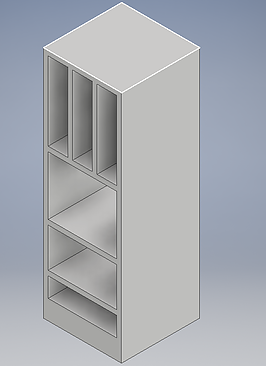 There will have several shelves that will have slightly different heights. Currently, the stairs are up to debate since it will need a lot of space. We might replce it with a small ladder to make the house look bigger. Enough money was foundraised to obtain a trailer for the tiny house. The trailer will take three to 4 weeks to arrive. When the trailer arrives, the team will begin building the framing and continue to contact companies and members of our community in hopes of obtaining additional fundings and materials.